Paine Hall welcomed a full house for the first of the Tanner Lectures. Homi K. Bhabha (from left), director of the Mahindra Humanities Center, Tanner Lecturer Masha Gessen, and Harvard Professor Jacqueline Bhabha respond to questions from the audience. Migration is not a tale of numbers. Although too often reports on the massive global population shifts of the past few decades devolve into statistics, the real stories are those of the people — the individuals who choose or were forced to leave a place previously defined as “home” and seek another. 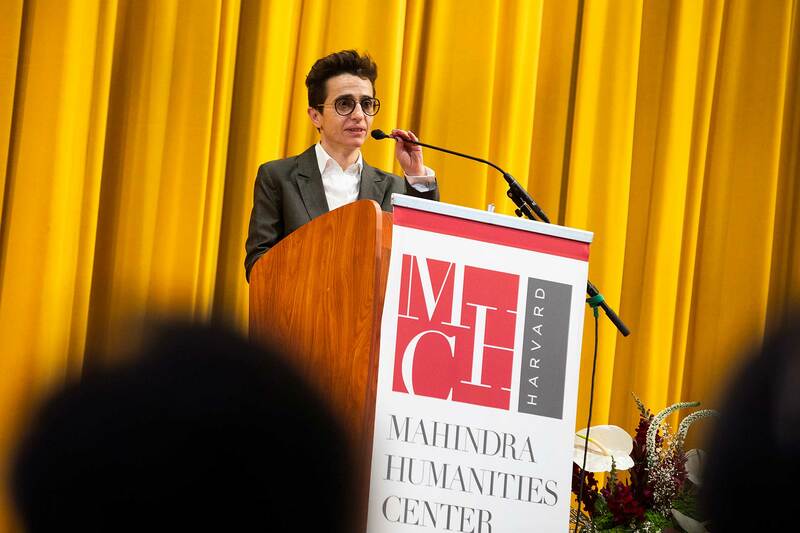 That was the focus of Masha Gessen’s lecture “How We Think About Migration,” delivered Wednesday at Paine Hall. In this, the first of two lectures on “How Do We Talk About Migration” that Gessen delivered as part of the Tanner Lectures on Human Values, the author and journalist focused exclusively on individuals, giving the sold-out crowd narrative snapshots of real people uprooted and often still on the move. “I’ve been thinking about what a concentrated effort to tell stories about migration would look like,” Gessen said to open the lecture, which was sponsored by the Office of the President and the Mahindra Humanities Center at Harvard. After brief introductions by President Larry Bacow and Mahindra Center Director Homi K. Bhabha, Gessen began the share the stories of people affected by migration. Gessen reached back decades to start with the story of Ali Rexha. Born in Ulcinj, Montenegro, Rexha immigrated to the U.S. with his family when he was 5. When Gessen met him in 1999, he was back in the seaside resort town, working with the U.N.’s refugee agency, the United Nations High Commissioner for Refugees. Gessen drew on earlier reporting for Slate, The New Yorker, and other outlets to focus on specific details — how oddly appropriate it was that Rexha, who is now working to find shelter for the more than 30,000 Kosovars who fled the Balkan war zone for safety in Ulcinj, had a background in hotel management, for example — to bring the stories to life, showcasing the person who had been uprooted by war or social upheaval. Others had never wanted to leave. Reyda Linn was a journalist and LGBTQ activist in Russia, who “kept getting arrested for these incredibly imaginative protests,” said Gessen. Linn’s marriage was one of them. Her wife, Sofya Grozovskaya, is transgender, and thus, under Putin, was not recognized as a woman. That meant the two could marry legally, even in an increasingly homophobic state. But while they could not be denied marriage, they were forced to wed behind closed doors, and their safety became increasingly tenuous. After three months, the couple left Russia for France. “The very idea that Sofya and I might be separated makes me nauseated,” Gessen recalled Linn saying. Unwanted separation was a theme that kept recurring through the 57 stories, including those of Gessen’s family: “There are as many opportunities to separate families as there are segments in a refugee’s journey,” said Gessen. In the discussion that followed, Jacqueline Bhabha, the FXB Director of Research, professor of the practice of health and human rights at the Harvard T.H. Chan School of Public Health, questioned the definition of home as a place of safety. She pointed out that home is often dangerous — especially to women and children. Gessen acknowledged this, but returned to the idea of home — and of borders in general. More important, Gessen stressed, are the stories of individuals, which of course far outnumber those presented Wednesday. “What I tried to do is tell these stories without generalizing,” Gessen said. “As it turns out, it is almost impossible to tell an individual story without trying to explain why I am trying to tell this story, which is when you start to generalize. The second lecture, “Some Ideas for Talking About Migration,” was given at Paine Hall today. Panelists at Harvard agree that it is likely the Mueller report will be released. Special investigator Robert S. Mueller III is pictured walking past the White House.